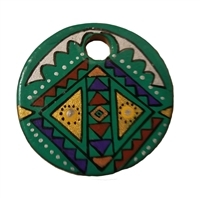 Green Southwestern Design Painted Round Pendant Craft Accent Embellishment. Made of resin. Pendant measures 35 mm (1-3/8 inches) in diameter and approximately 3 mm thick. Hole measures approximately 6 mm (1/4 inch) in diameter. Flat back. Pendant measures 38 mm (approximately 1-1/2") Long by 44 mm (approx. 1-3/4") Wide with a 2.5 mm Hole. Longhorn Steer Cow Skull Cowgirl Boho Western Jewelry Charm Pendant. Made of plastic resin. Imitation bone. 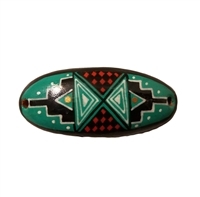 Pendant measures approximately 48 mm (1-7/8 inches) long by 52 mm (1-1/16 inches) wide. Includes 4 mm (1/4 inch) hole for hanging. Measure 34 mm (1-5/16 inches) wide and approximately 4 mm in thickness. Include a 2 mm hole for hanging. Painted black resin. 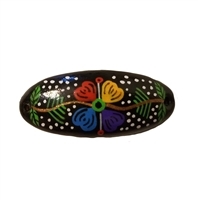 Pendant measures approximately 65 mm (2-5/8 inches) long by 32 mm (1-1/4 inches) wide and approximately 4 mm thick. Includes small (approximately 1 mm) top-drilled hole for hanging. Black with painted flower design. Made of resin. Pendant measures approximately 40 mm (1-5/8 inches) long by 17 mm (11/16 inches) wide and approximately 3 mm thick. Includes small (approximately 1 mm) hole on either end for stringing. Black with painted southwestern design. Made of resin. Pendant measures approximately 40 mm (1-5/8 inches) long by 17 mm (11/16 inches) wide and approximately 3 mm thick. Includes small (approximately 1 mm) hole on either end for stringing. 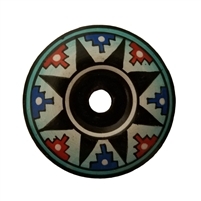 Southwestern Sun Design Painted Round Ring Disc/Saucer Charm for jewelry making or other craft accent. Made of resin. Pendant measures 40 mm (1-5/8 inches) in diameter and approximately 3 mm thick. Center hole measures 6 mm in diameter. Painted on both sides. Black, Turquoise, Red, and Blue. 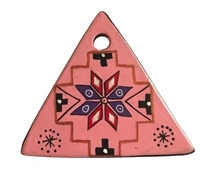 Southwestern Design Pink Painted Triangle Pendant Craft Accent Embellishment. Made of resin. Pendant measures 2-3/8 x 2-1/8 inches and approximately 3 mm thick. Hole measures approximately 1/4 inch in diameter. Flat back. Tribal Tiki Mask Large Black, Red, & White Craft Button or Pendant. Made of resin. Measures 2-5/8 x 1-1/8 inches and approximately 1/4 inch thick. Hole measures approximately 3 mm (1/8 inch) in diameter.